We had such a wonderful morning Easter Sunday. Parents, grandparents, children, teens and friends of All Saints’ joined us for our annual Easter Eggstravaganza in Barnett Park. Festivities began shortly after 10 a.m. with an opening prayer before the actual egg hunt started. Children of all ages enjoyed their hunting! Thanks to the efforts of some of our awesome teens and other generous volunteers, we had children getting photos with the Easter bunny, balloon art, face painting, Easter nail art, cookie decorating and crafts. The children also enjoyed playing together on Barnett Park's playground equipment. Join us for Vacation Bible School! 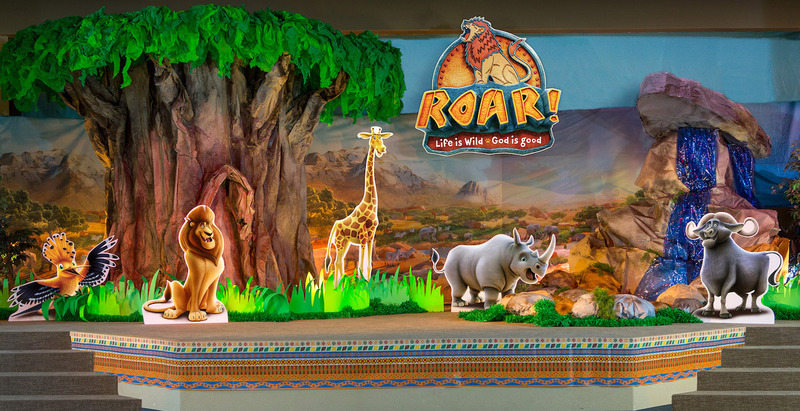 Give your child a FUN, CREATIVE, and INTERACTIVE opportunity to explore God’s goodness and celebrate a ferocious faith that powers them through this wild life, June 3-7. Students will experience God’s word through song and play, wild Bible adventure crafts, stampede sports games, and more. You don’t want to miss out on this summer safari adventure! Classes will take place each morning from 8:45am – 12pm. Snack is provided. Friday March 15th found the members of All Saints’ Outreach Committee deeply concerned about the weather for Saturday’s Compassion Day. Lots of prayers were said as we decided to have trust and faith in our Lord. On Saturday, the weather was perfect. Our prayers were answered! The day began early at 7:30AM. Our parking crew, led by Terry Karr and assisted by Stuart Dow and Jack Runyon, were at N. Lake Wire to direct the painting crews in getting parked so they could start painting at 8:00 AM. We’re So Happy You're Here! We hope you enjoy our short video about All Saints'. Our goal was to not just tell you about our church but actually give you a feeling for who we are and what being a part of our family is like. We encourage you to look further into what makes our church "home" for so many people. Our church is a warm, wonderful place to grow and deepen a relationship with Jesus, make new friends, and be part of a family who will love you. Please put your shopping to work on behalf of All Saints’ by participating in the AmazonSmile program. If you already shop on Amazon, just use the same account to register for the AmazonSmile program. If you’re new to online shopping on Amazon … What are you waiting for? You order things and they show up at your house! What a wonderful world!